Make sure the creatine or BCAA supplement you take passed our tests and is right for you! Do supplements such as creatine and branched-chain amino acids (BCAAs) really improve muscle strength, size, and/or recovery? Are they safe to take, and if so, which ones are best? 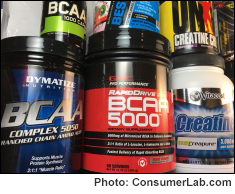 To answer these questions, ConsumerLab.com reviewed the clinical evidence, and purchased and rigorously tested popular creatine and BCAA supplements on the market. Our tests revealed problems with some products: for example, one creatine supplement was contaminated with unacceptable levels of impurities, and a BCAA supplement contained less leucine (the most important BCAA for protein synthesis) than claimed. Fortunately, we also identified several high quality creatine and BCAA supplements, among which we selected our Top Picks, which were also economically priced. You must become a ConsumerLab.com member to get the full test results for creatine and BCAA supplements. You will get results for seven creatine supplements and nine BCAA supplements, including products selected for testing by ConsumerLab.com and several which passed the same tests through CL's voluntary Quality Certification Program.